One of the most tragic things I’ve heard as a youth pastor are the countless stories of parents who are not active in the life of their children. While the story is different for each student the end result is the same..a child who feels that they are not loved by their parent. I’ve always wondered how this happen’s? How can a parent not care about their child, not be involved in their life? Where does it start? And then it happened. I came home from work, changed into some shorts and took my almost two year old son outside to play “ball”. Liam loves to play ball. He loves anything that looks like a ball. In fact, he loves apples and oranges, mostly because they are shaped in the form of a ball. 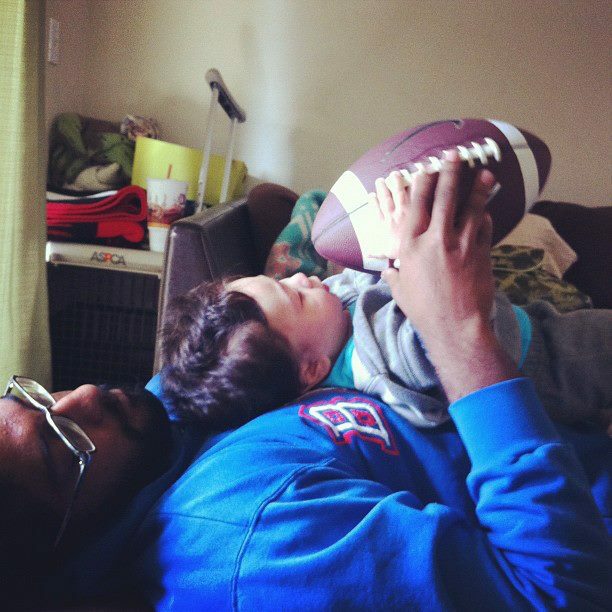 His passion and love for sports and ball’s in general probably started when I would lay him on my chest and throw a football in the air when he was just 2 months old. While tossing Liam the ball I felt the familiar buzz of my iPhone in my pocket notifying me of a text message or work email. I thought that I could quickly peek at my email in between tossing the ball. Liam saw me pull out my phone and quickly walked over to me and simply said “No, dad”. At first I thought he was referring to the ball that I was holding. A few minutes later I felt the buzz again and checked my email. This time Liam walked over to me, held my hand, and said, “No, dad. dadda, please, no”. And then it hit me. This is where it starts. Liam wanted my attention. Not 95% of my attention but all of my attention. Somewhere over the course of 19 month’s Liam made a correlation between my iPhone and the amount of attention he gets from Dad. Simply, when there is no iPhone he gets all of Dads attention. In the presence of an iPhone he does not get dads attention. This is where it starts. When Liam said, “No, Dad” he brought to attention the beginning roots of what could result in me becoming the very parent that would leave my son telling the very story that I hated to hear, to his youth pastor. It’s because of this very reason that I try my best to do the following things. While I’m not perfect with these, it has already made a huge difference. Get to work on time or earlier – I find that when I get into the office early I get a lot more done. When I am more productive and efficient at work, I don’t have to worry about taking work home with me. Listen to your wife – My best gauge of how I am doing in balancing work and home is my wife. If you think you can do this on your own, your either amazing and on superman status, or your lying to yourself. A great resource that has been an encouragement to me is Pastor Mark Driscoll’s book, Pastor Dad. I have a long way to go in this area but I’d rather get a head start on this! This entry was posted in Leadership, Uncategorized and tagged Balance, Dad, Fatherhood, Football, Responsability by jmuddamalle. Bookmark the permalink.